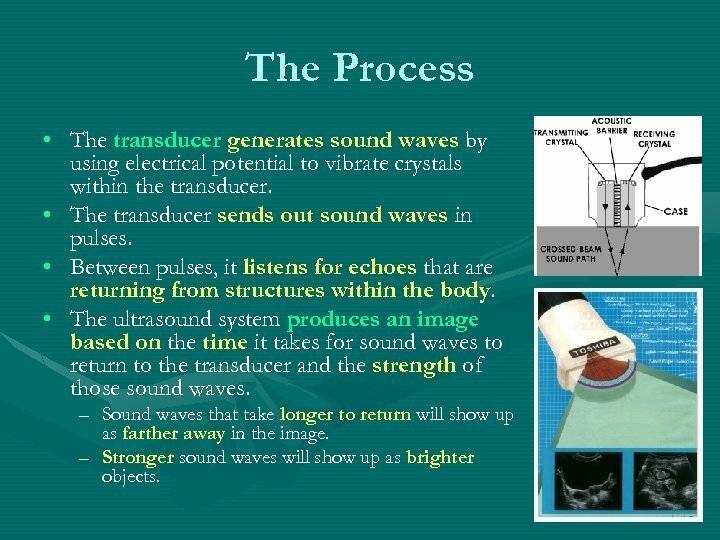 The Process • The transducer generates sound waves by using electrical potential to vibrate crystals within the transducer. • The transducer sends out sound waves in pulses. • Between pulses, it listens for echoes that are returning from structures within the body. 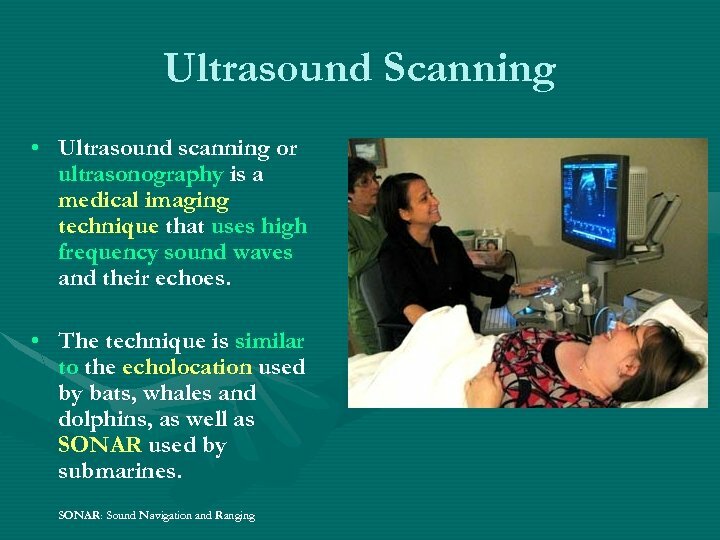 • The ultrasound system produces an image based on the time it takes for sound waves to return to the transducer and the strength of those sound waves. – Sound waves that take longer to return will show up as farther away in the image. – Stronger sound waves will show up as brighter objects. 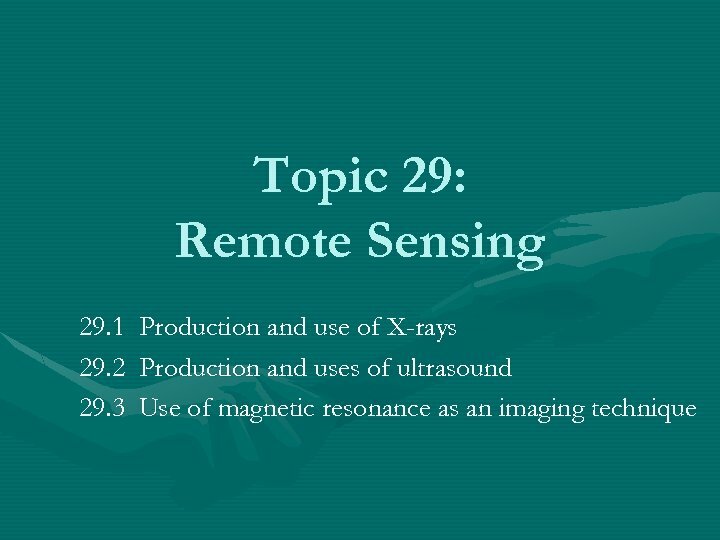 The Transducer Probe • The transducer probe is the main part of the ultrasound machine. 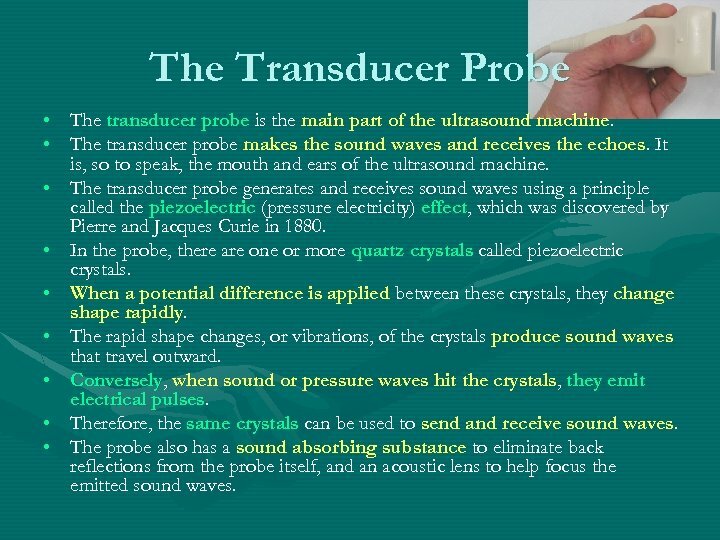 • The transducer probe makes the sound waves and receives the echoes. 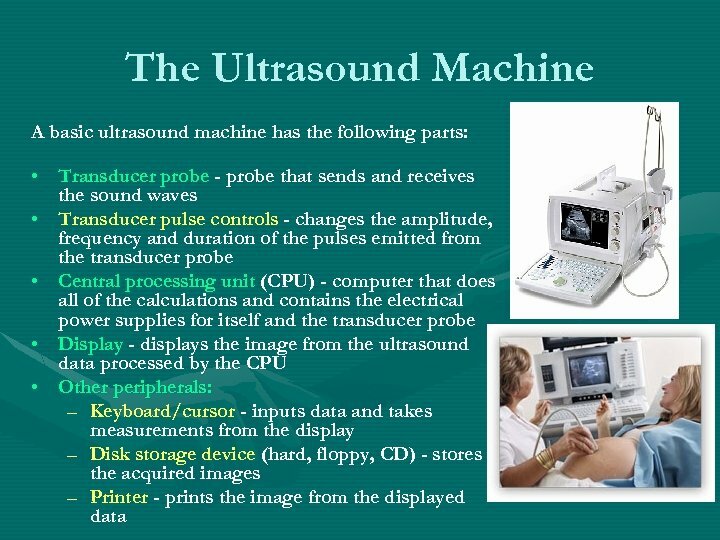 It is, so to speak, the mouth and ears of the ultrasound machine. 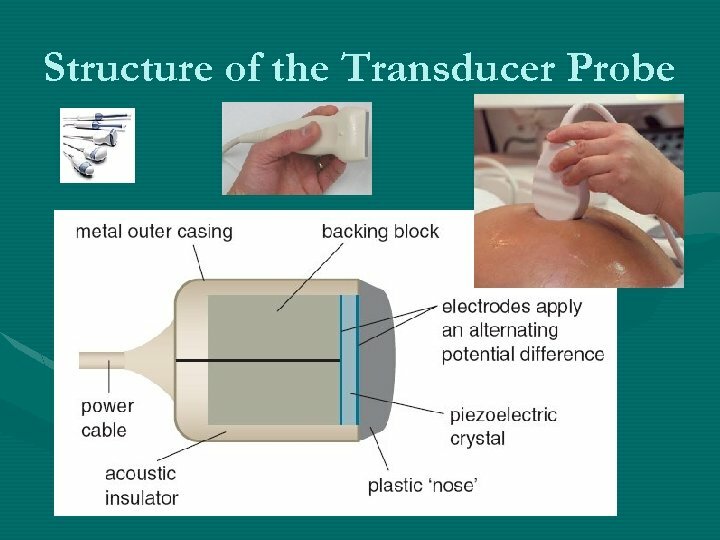 • The transducer probe generates and receives sound waves using a principle called the piezoelectric (pressure electricity) effect, which was discovered by Pierre and Jacques Curie in 1880. • In the probe, there are one or more quartz crystals called piezoelectric crystals. • When a potential difference is applied between these crystals, they change shape rapidly. • The rapid shape changes, or vibrations, of the crystals produce sound waves that travel outward. • Conversely, when sound or pressure waves hit the crystals, they emit electrical pulses. • Therefore, the same crystals can be used to send and receive sound waves. • The probe also has a sound absorbing substance to eliminate back reflections from the probe itself, and an acoustic lens to help focus the emitted sound waves. 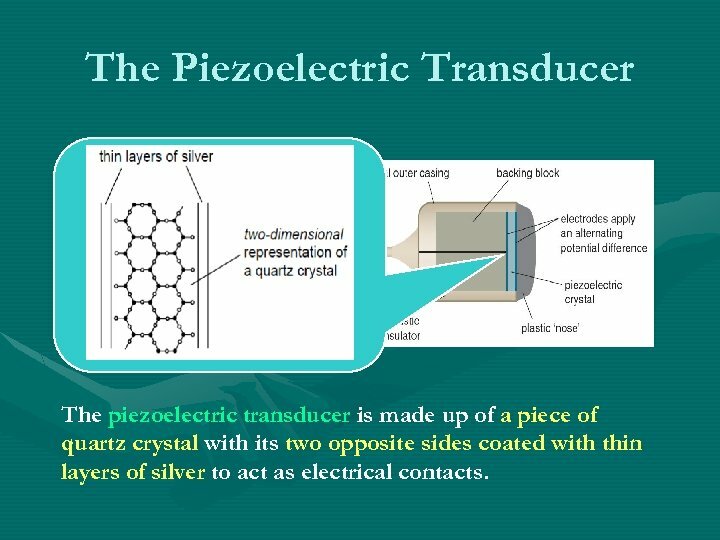 The Piezoelectric Transducer The piezoelectric transducer is made up of a piece of quartz crystal with its two opposite sides coated with thin layers of silver to act as electrical contacts. 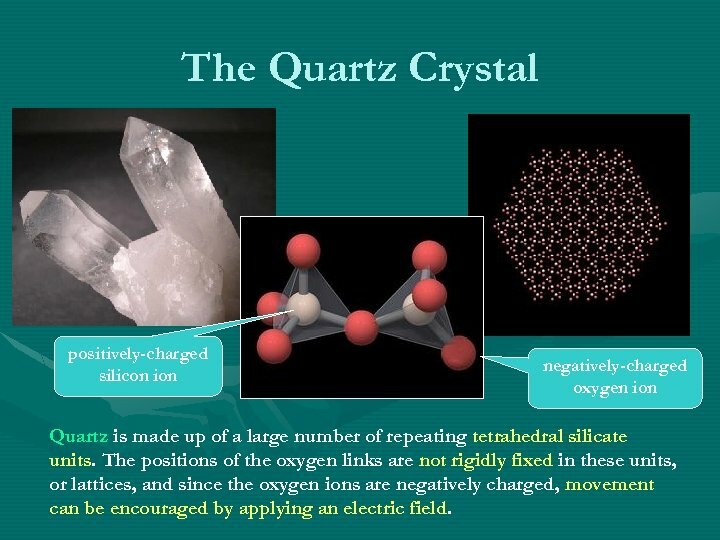 The Quartz Crystal positively-charged silicon ion negatively-charged oxygen ion Quartz is made up of a large number of repeating tetrahedral silicate units. The positions of the oxygen links are not rigidly fixed in these units, or lattices, and since the oxygen ions are negatively charged, movement can be encouraged by applying an electric field. 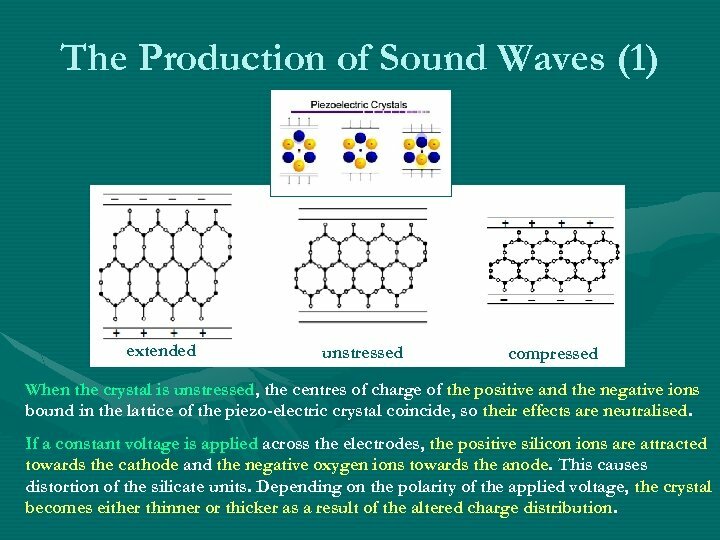 The Production of Sound Waves (1) extended unstressed compressed When the crystal is unstressed, the centres of charge of the positive and the negative ions bound in the lattice of the piezo-electric crystal coincide, so their effects are neutralised. If a constant voltage is applied across the electrodes, the positive silicon ions are attracted towards the cathode and the negative oxygen ions towards the anode. This causes distortion of the silicate units. Depending on the polarity of the applied voltage, the crystal becomes either thinner or thicker as a result of the altered charge distribution. 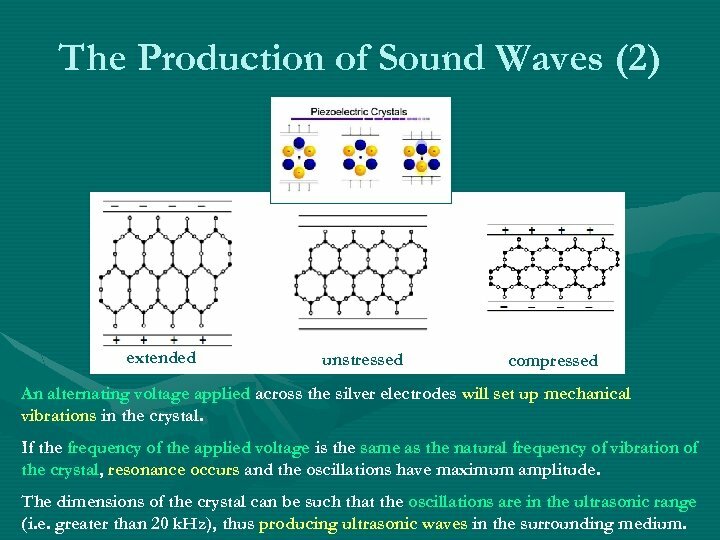 The Production of Sound Waves (2) extended unstressed compressed An alternating voltage applied across the silver electrodes will set up mechanical vibrations in the crystal. 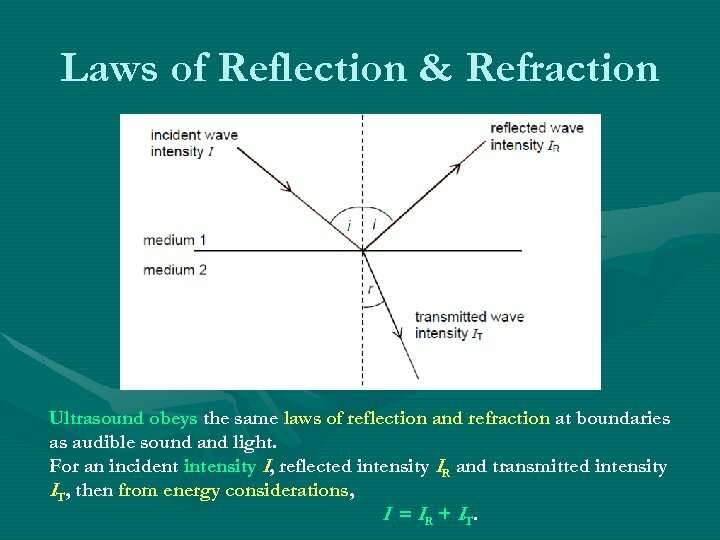 If the frequency of the applied voltage is the same as the natural frequency of vibration of the crystal, resonance occurs and the oscillations have maximum amplitude. The dimensions of the crystal can be such that the oscillations are in the ultrasonic range (i. e. greater than 20 k. Hz), thus producing ultrasonic waves in the surrounding medium. The Production of Electrical Pulses extended unstressed compressed v Ultrasonic transducers can also be used as receivers. 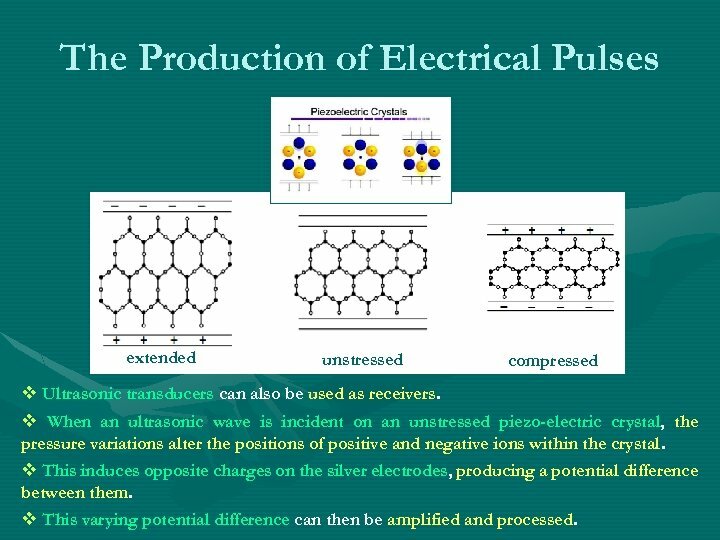 v When an ultrasonic wave is incident on an unstressed piezo-electric crystal, the pressure variations alter the positions of positive and negative ions within the crystal. v This induces opposite charges on the silver electrodes, producing a potential difference between them. v This varying potential difference can then be amplified and processed. 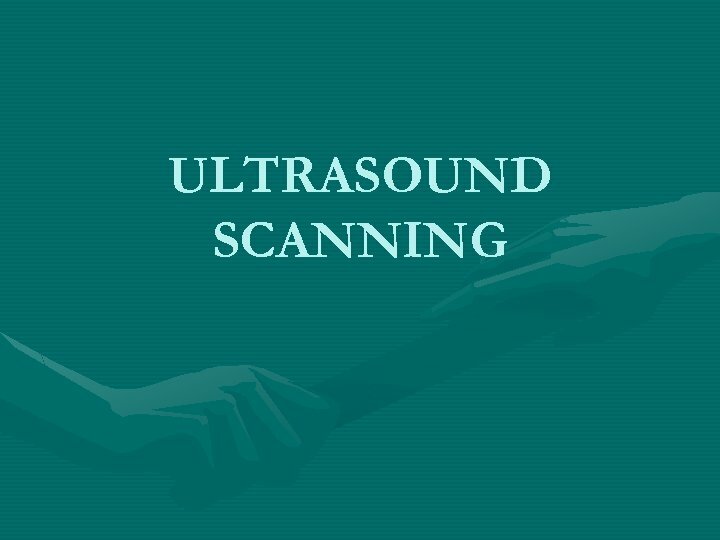 Ultrasound Imaging Ultrasound imaging is performed by emitting a pulse, which is partly reflected from a boundary between two tissue structures, and partially transmitted. 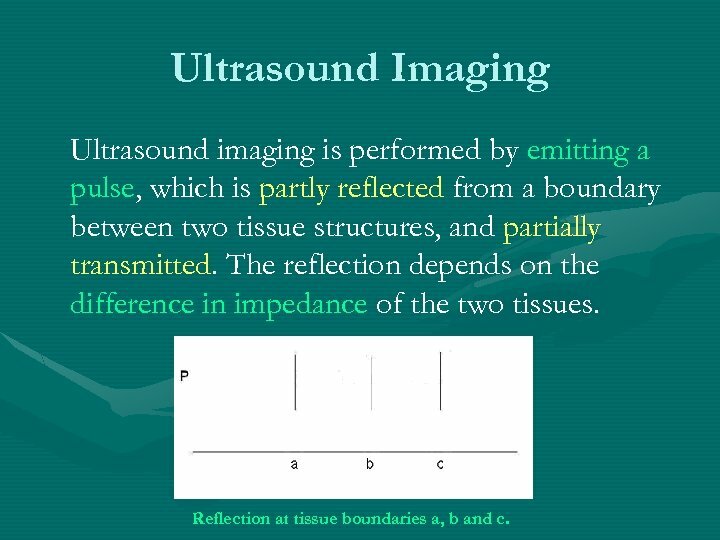 The reflection depends on the difference in impedance of the two tissues. 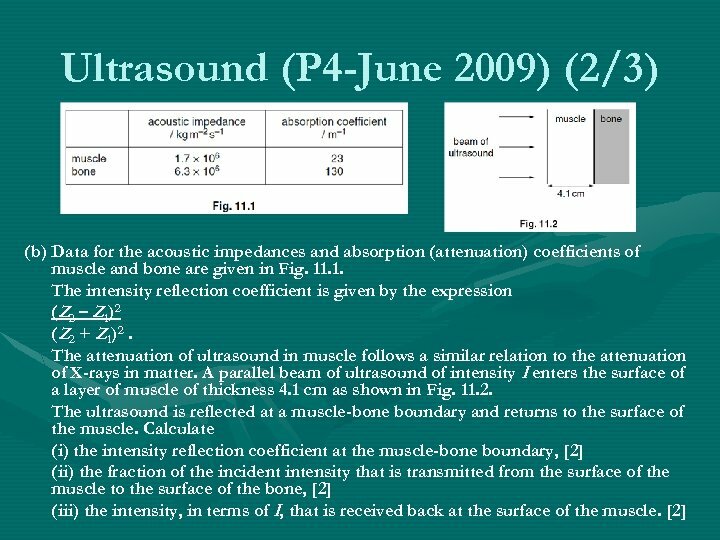 Reflection at tissue boundaries a, b and c.
Laws of Reflection & Refraction Ultrasound obeys the same laws of reflection and refraction at boundaries as audible sound and light. 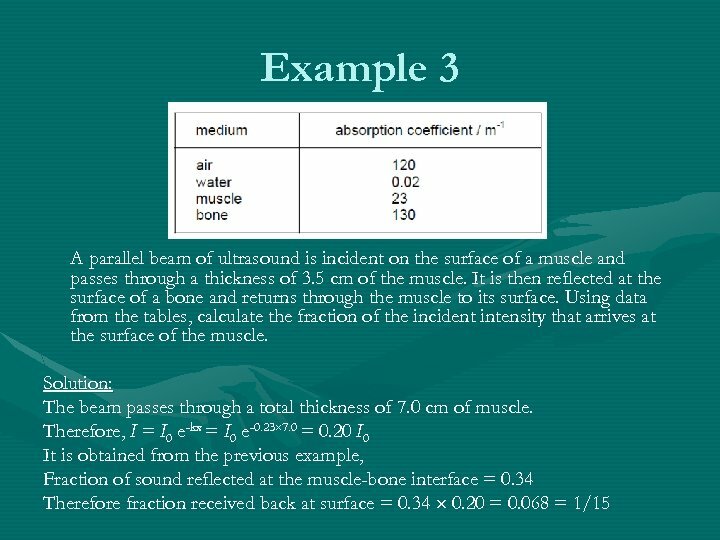 For an incident intensity I, reflected intensity IR and transmitted intensity IT, then from energy considerations, I = IR + IT. 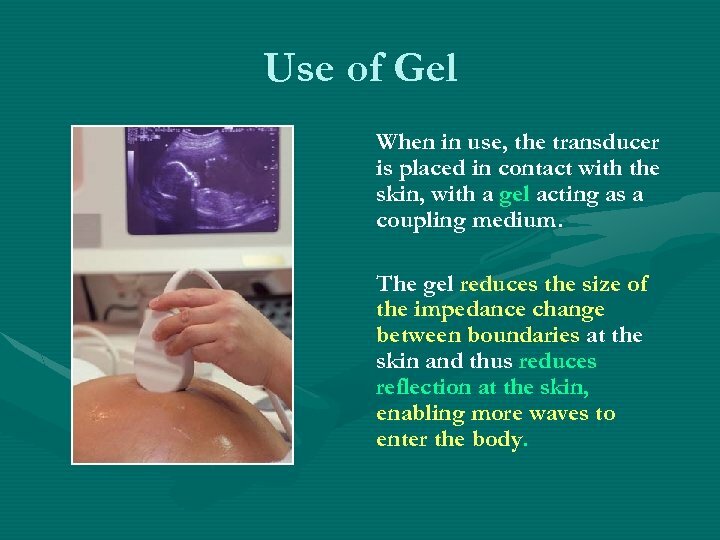 Use of Gel When in use, the transducer is placed in contact with the skin, with a gel acting as a coupling medium. The gel reduces the size of the impedance change between boundaries at the skin and thus reduces reflection at the skin, enabling more waves to enter the body. 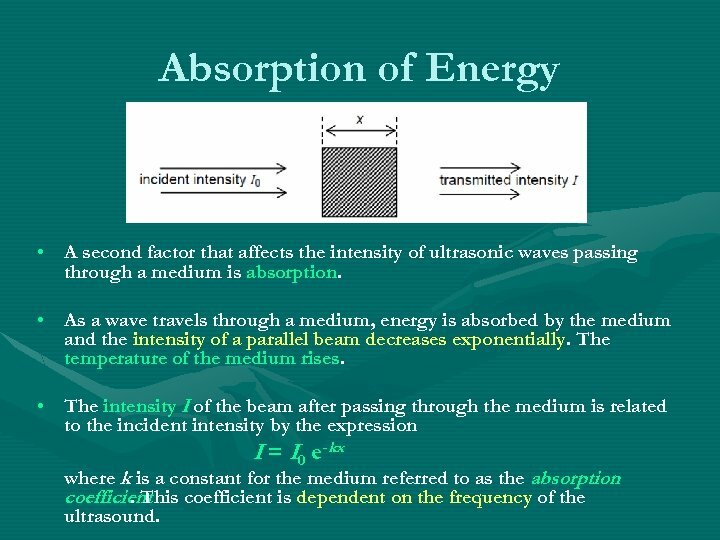 Absorption of Energy • A second factor that affects the intensity of ultrasonic waves passing through a medium is absorption • As a wave travels through a medium, energy is absorbed by the medium and the intensity of a parallel beam decreases exponentially. The temperature of the medium rises. 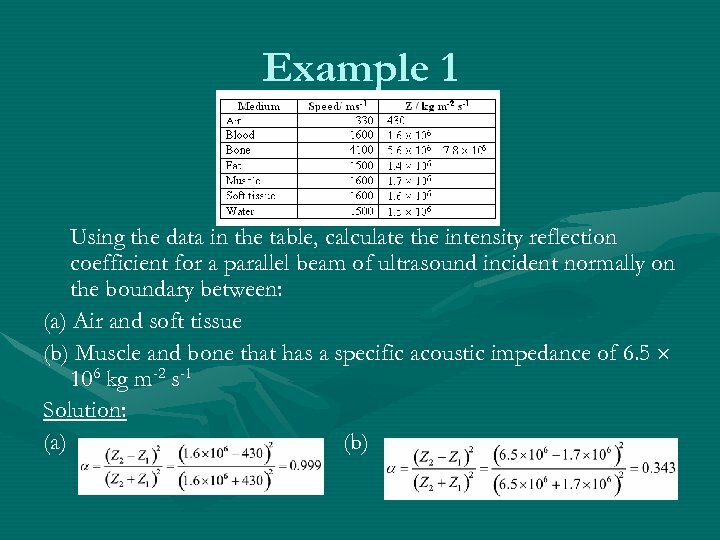 • The intensity I of the beam after passing through the medium is related to the incident intensity by the expression I = I 0 e-kx where k is a constant for the medium referred to as the absorption coefficient is dependent on the frequency of the. This ultrasound. 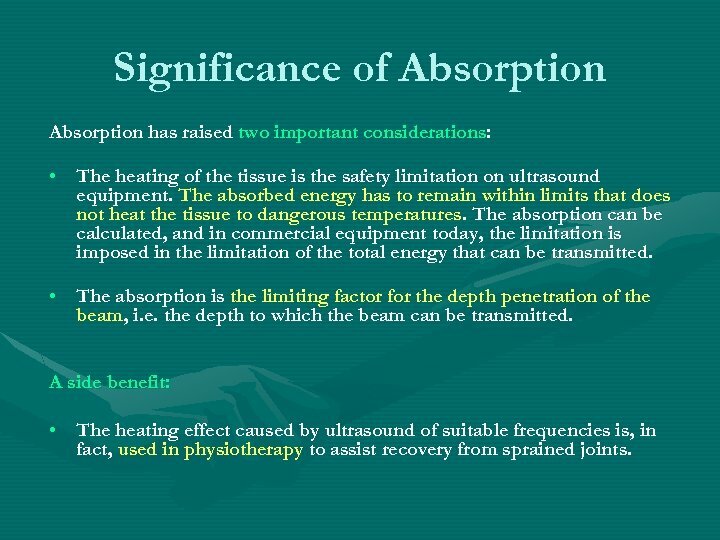 Significance of Absorption has raised two important considerations: • The heating of the tissue is the safety limitation on ultrasound equipment. The absorbed energy has to remain within limits that does not heat the tissue to dangerous temperatures. 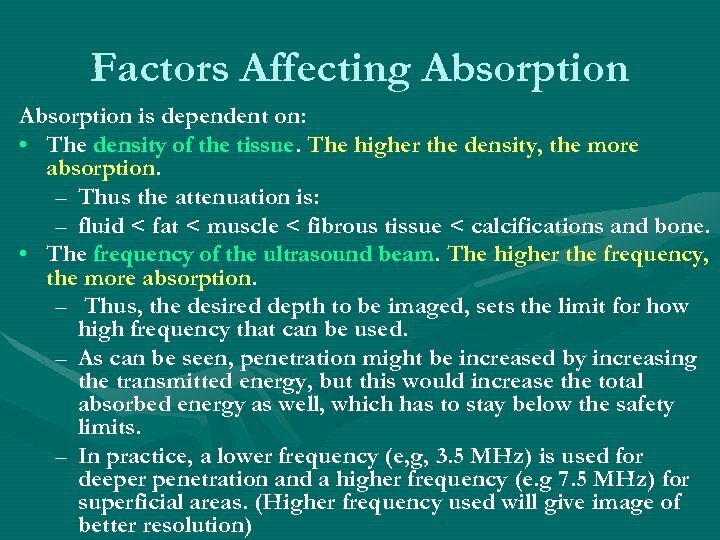 The absorption can be calculated, and in commercial equipment today, the limitation is imposed in the limitation of the total energy that can be transmitted. 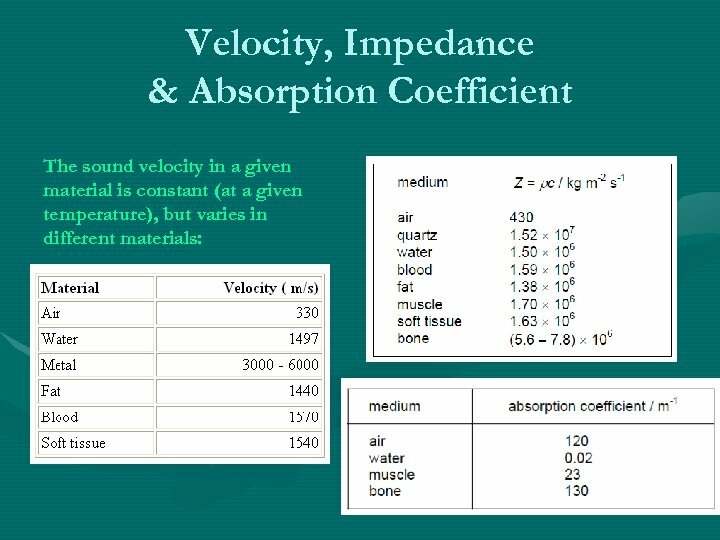 • The absorption is the limiting factor for the depth penetration of the beam, i. e. the depth to which the beam can be transmitted. 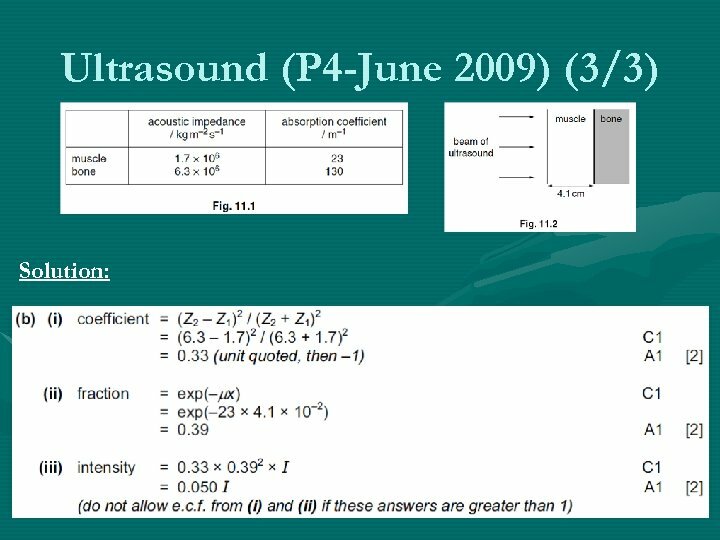 A side benefit: • The heating effect caused by ultrasound of suitable frequencies is, in fact, used in physiotherapy to assist recovery from sprained joints. 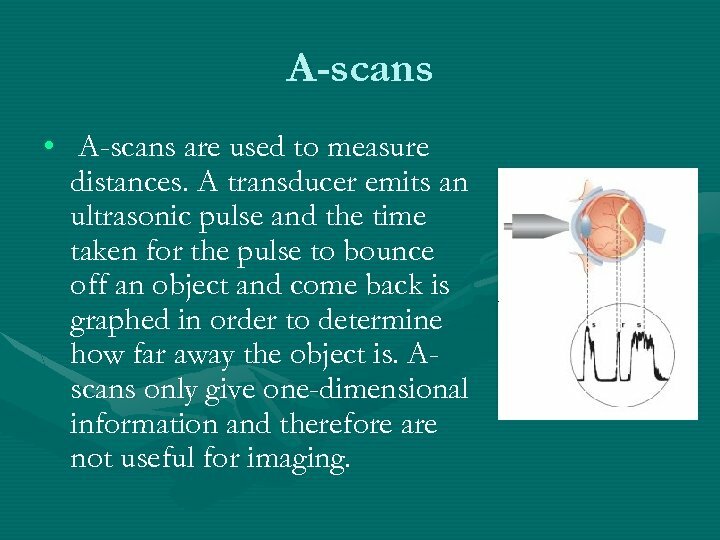 A-scans • A-scans are used to measure distances. A transducer emits an ultrasonic pulse and the time taken for the pulse to bounce off an object and come back is graphed in order to determine how far away the object is. Ascans only give one-dimensional information and therefore are not useful for imaging. 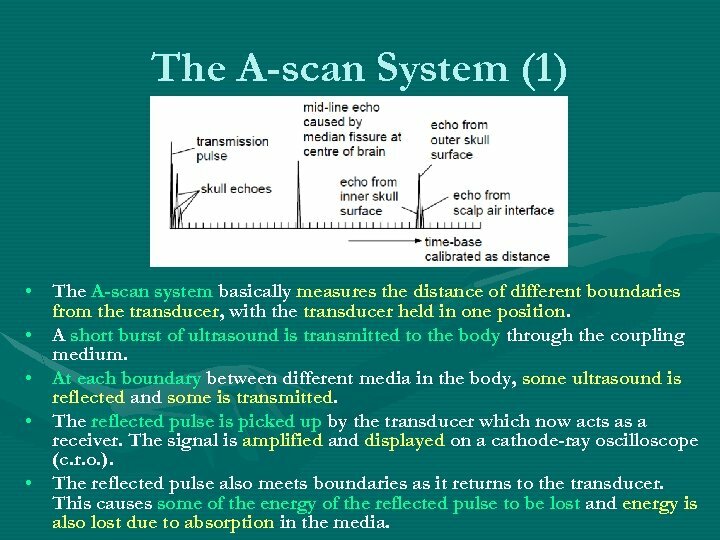 The A-scan System (1) • The A-scan system basically measures the distance of different boundaries from the transducer, with the transducer held in one position. 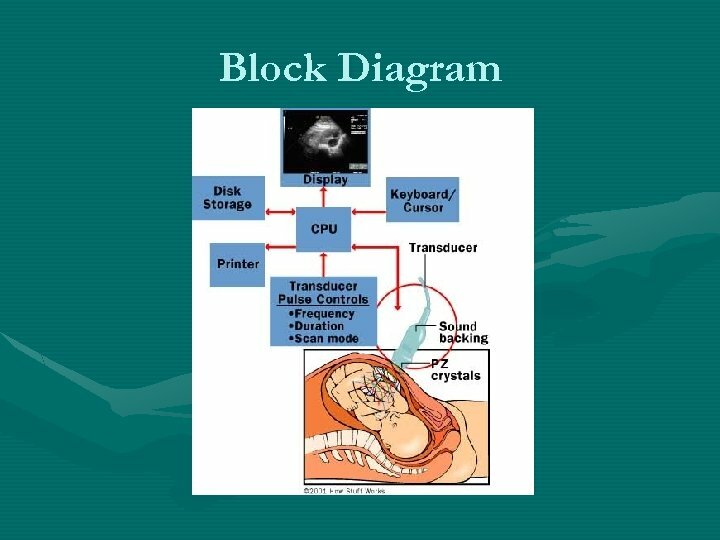 • A short burst of ultrasound is transmitted to the body through the coupling medium. 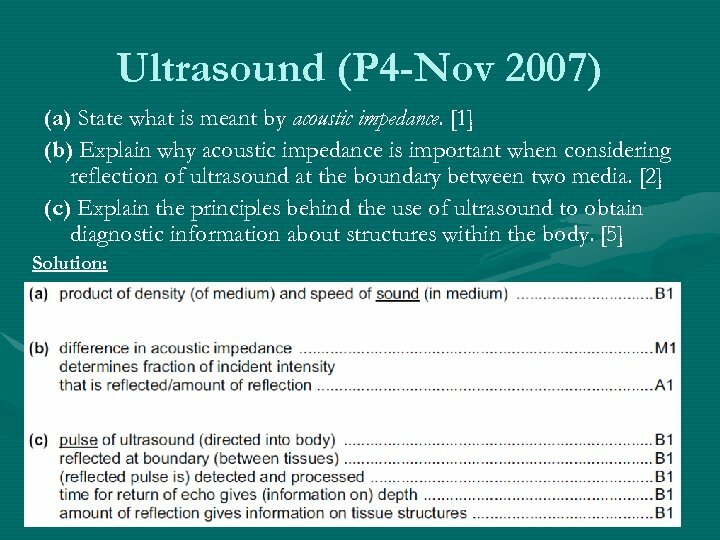 • At each boundary between different media in the body, some ultrasound is reflected and some is transmitted. 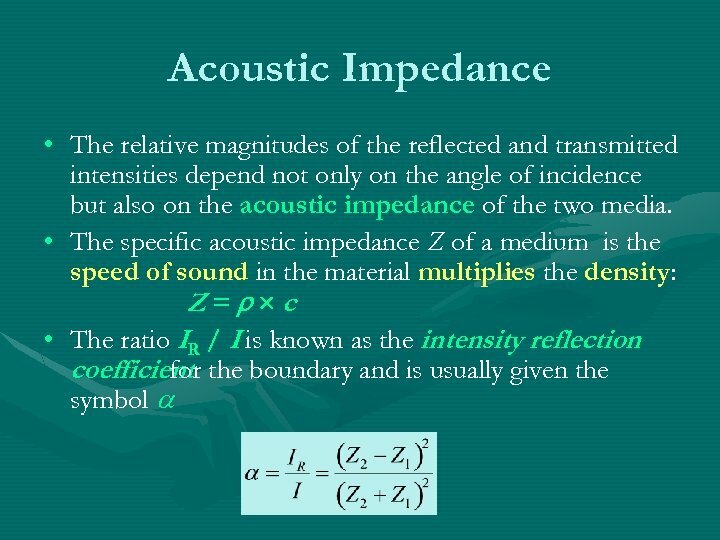 • The reflected pulse is picked up by the transducer which now acts as a receiver. The signal is amplified and displayed on a cathode-ray oscilloscope (c. r. o. ). • The reflected pulse also meets boundaries as it returns to the transducer. 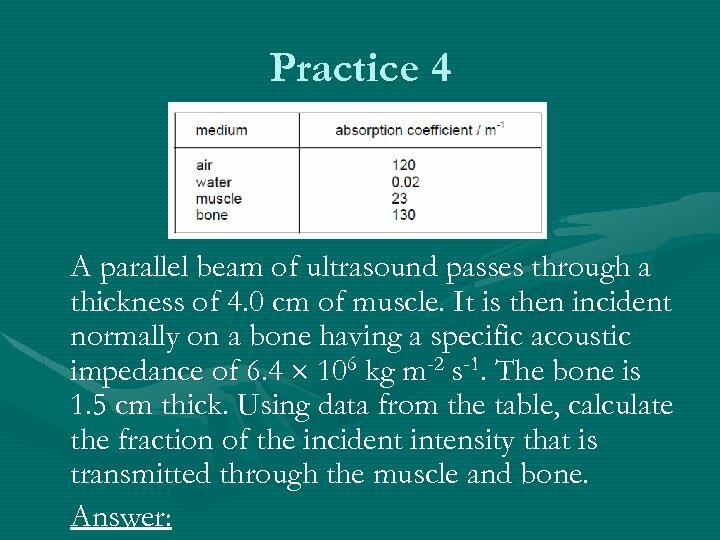 This causes some of the energy of the reflected pulse to be lost and energy is also lost due to absorption in the media. 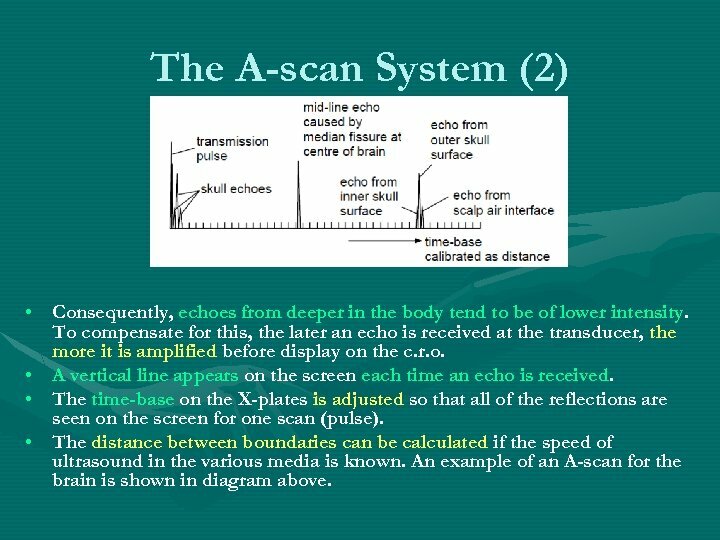 The A-scan System (2) • Consequently, echoes from deeper in the body tend to be of lower intensity. To compensate for this, the later an echo is received at the transducer, the more it is amplified before display on the c. r. o. • A vertical line appears on the screen each time an echo is received. • The time-base on the X-plates is adjusted so that all of the reflections are seen on the screen for one scan (pulse). 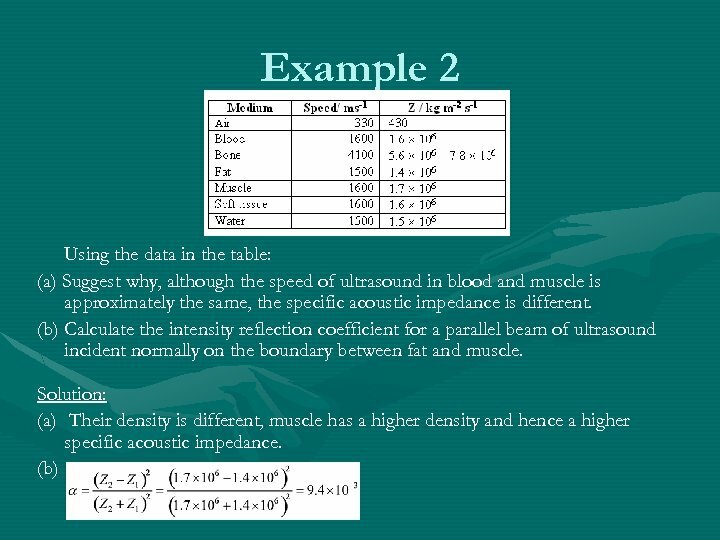 • The distance between boundaries can be calculated if the speed of ultrasound in the various media is known. An example of an A-scan for the brain is shown in diagram above. 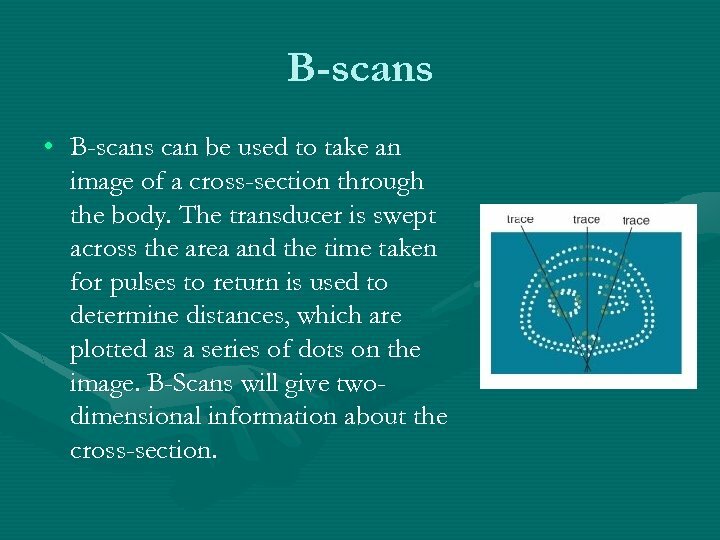 B-scans • B-scans can be used to take an image of a cross-section through the body. The transducer is swept across the area and the time taken for pulses to return is used to determine distances, which are plotted as a series of dots on the image. B-Scans will give twodimensional information about the cross-section. 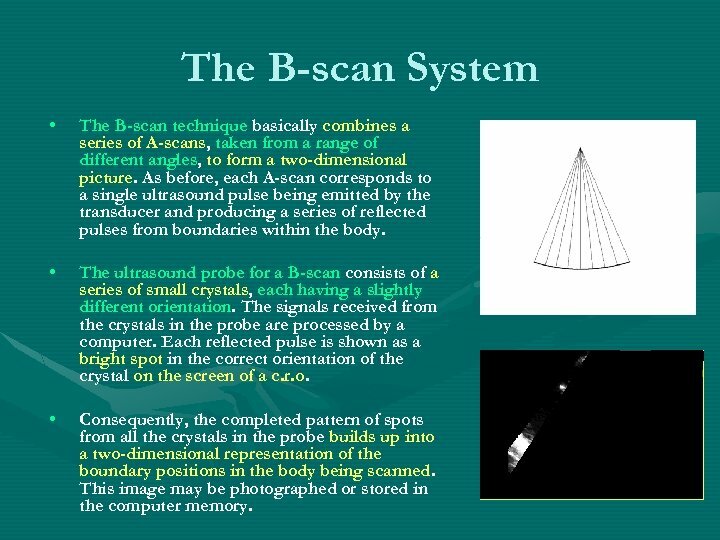 The B-scan System • The B-scan technique basically combines a series of A-scans, taken from a range of different angles, to form a two-dimensional picture. 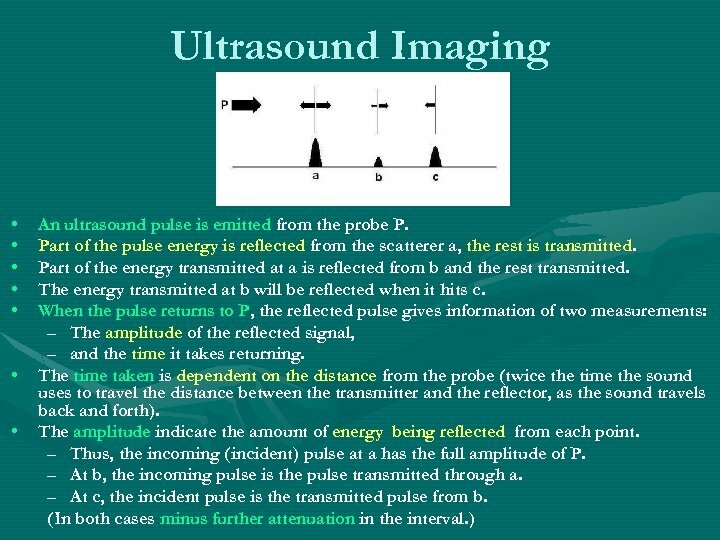 As before, each A-scan corresponds to a single ultrasound pulse being emitted by the transducer and producing a series of reflected pulses from boundaries within the body. 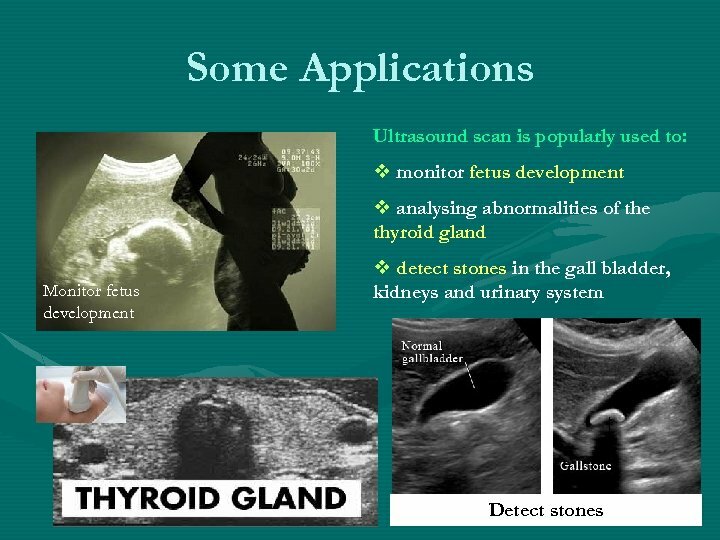 • The ultrasound probe for a B-scan consists of a series of small crystals, each having a slightly different orientation. The signals received from the crystals in the probe are processed by a computer. Each reflected pulse is shown as a bright spot in the correct orientation of the crystal on the screen of a c. r. o. • Consequently, the completed pattern of spots from all the crystals in the probe builds up into a two-dimensional representation of the boundary positions in the body being scanned. This image may be photographed or stored in the computer memory. 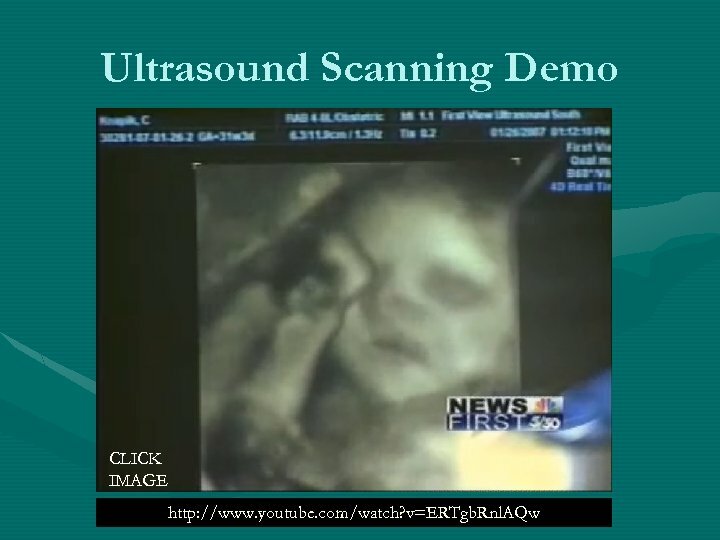 3 -D Images A 3 -D ultrasound uses the same principle as a 2 -D ultrasound. The difference is that the sound waves are emitted from all angles. 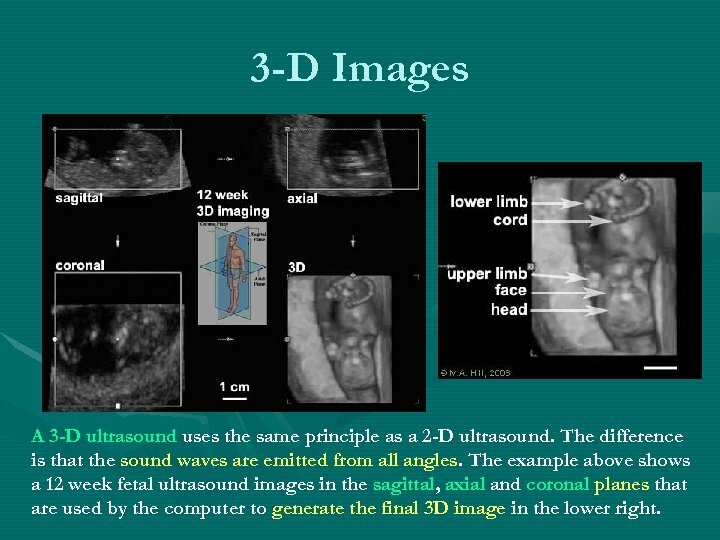 The example above shows a 12 week fetal ultrasound images in the sagittal, axial and coronal planes that sagittal are used by the computer to generate the final 3 D image in the lower right. 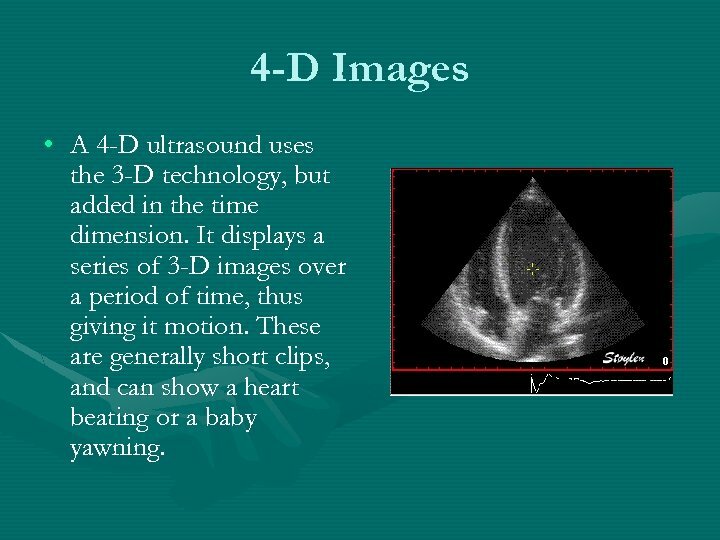 4 -D Images • A 4 -D ultrasound uses the 3 -D technology, but added in the time dimension. It displays a series of 3 -D images over a period of time, thus giving it motion. These are generally short clips, and can show a heart beating or a baby yawning. 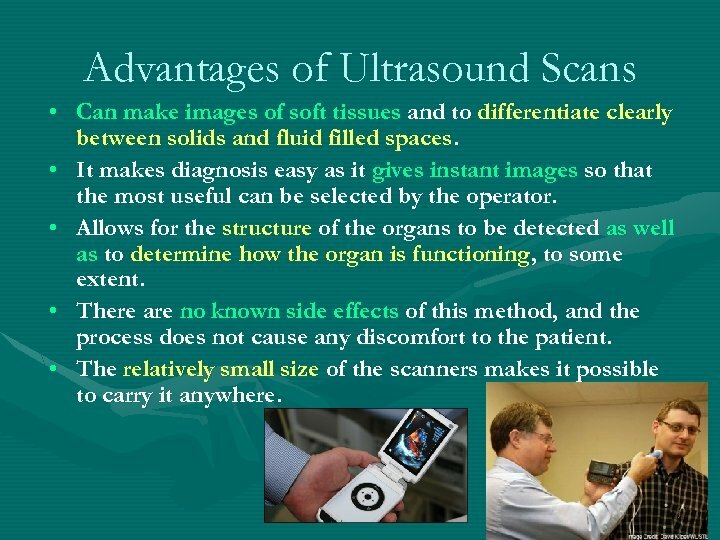 Advantages of Ultrasound Scans • Can make images of soft tissues and to differentiate clearly between solids and fluid filled spaces. • It makes diagnosis easy as it gives instant images so that the most useful can be selected by the operator. • Allows for the structure of the organs to be detected as well as to determine how the organ is functioning, to some extent. • There are no known side effects of this method, and the process does not cause any discomfort to the patient. • The relatively small size of the scanners makes it possible to carry it anywhere. 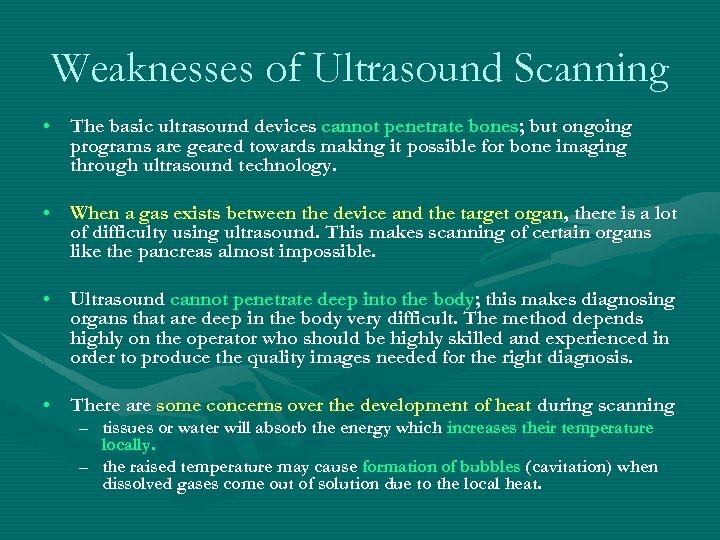 Weaknesses of Ultrasound Scanning • The basic ultrasound devices cannot penetrate bones; but ongoing programs are geared towards making it possible for bone imaging through ultrasound technology. 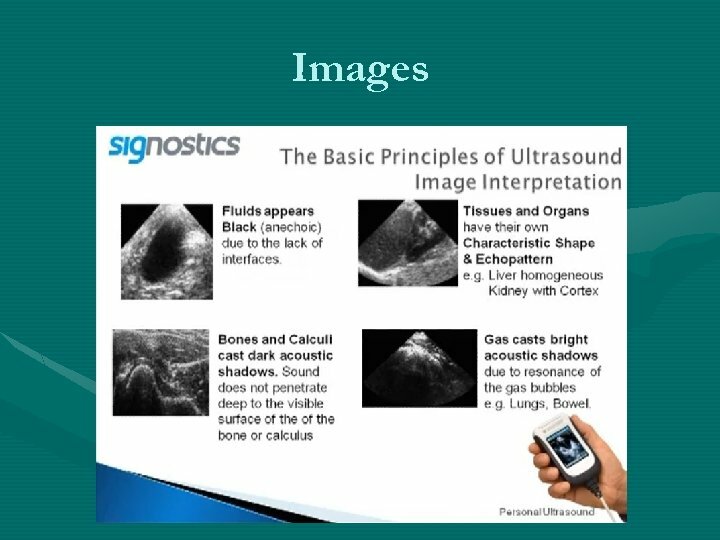 • When a gas exists between the device and the target organ, there is a lot of difficulty using ultrasound. This makes scanning of certain organs like the pancreas almost impossible. 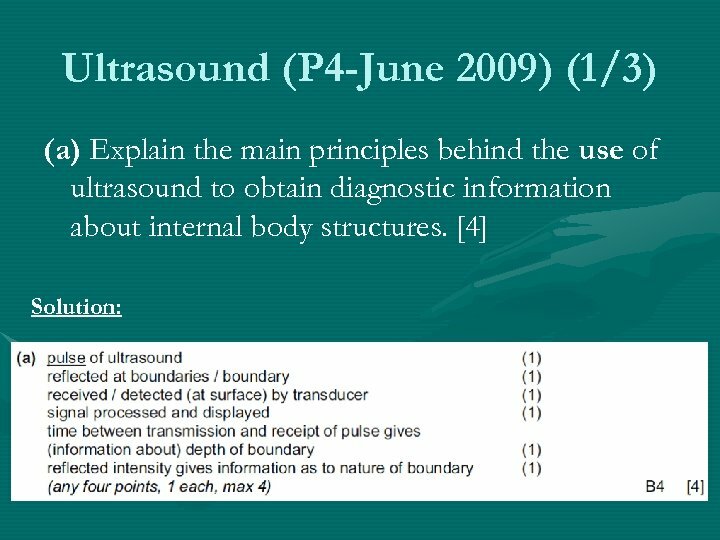 • Ultrasound cannot penetrate deep into the body; this makes diagnosing organs that are deep in the body very difficult. The method depends highly on the operator who should be highly skilled and experienced in order to produce the quality images needed for the right diagnosis. • There are some concerns over the development of heat during scanning – tissues or water will absorb the energy which increases their temperature locally. – the raised temperature may cause formation of bubbles (cavitation) when dissolved gases come out of solution due to the local heat. 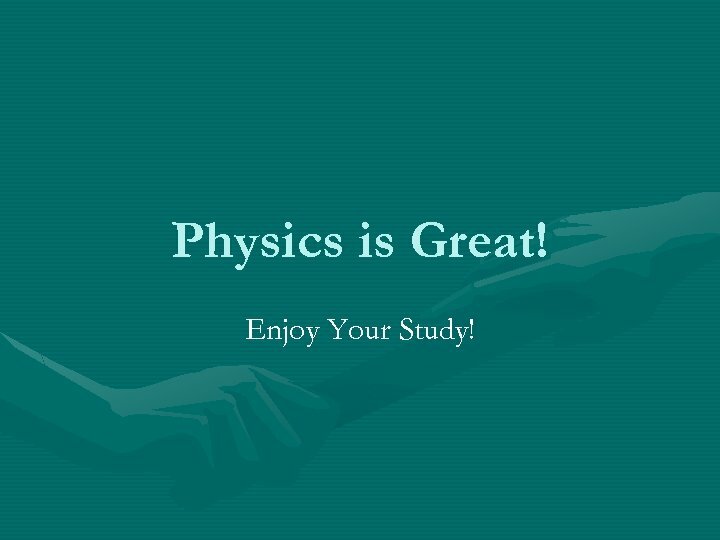 Physics is Great! Enjoy Your Study!